The leading net-lease retail REIT's management has done a good job so far this year. 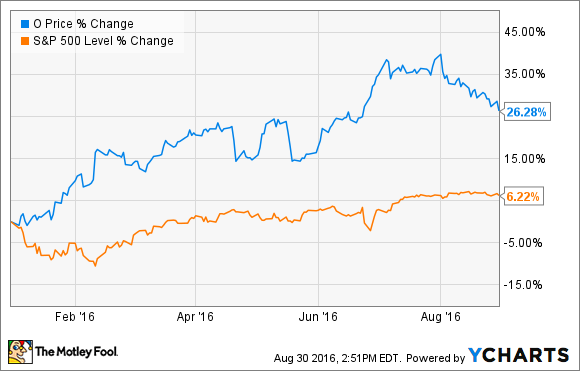 Net-lease retail REIT Realty Income Corporation (NYSE:O) has performed extremely well so far in 2016. Even after a recent pullback, the stock is still up by more than 26% year to date, significantly outperforming the market. A lot of this performance is due to factors outside the company's control -- low interest rates tend to cause dividend-seeking investors to flock to REITs, for instance. However, Realty Income has certainly been doing a lot right lately itself. Here are a few of the smart moves the company has made so far in 2016. Money is cheap right now for Realty Income. It can borrow cheaply -- the interest rate on its revolving credit facility was just 1.35% as of June 30. And because its share price has risen by about 42% over the past year, the company can raise more capital for acquisitions by issuing fewer new shares. At the beginning of 2016, Realty Income anticipated making about $750 million worth of new acquisitions for the year. However, when opportunity knocks, great companies answer, and that's exactly what Realty Income has done. With $663 million worth of acquisitions so far, Realty Income has nearly met its full-year target in half the time. After seeing the opportunities provided by the low cost of capital, the company increased its full-year acquisition target to $900 million after the first quarter, and again to $1.25 billion after the second. [T]hrough the first half of the year we completed $663 million in acquisitions at record high investment spreads relative to our weighted average cost of capital. ... We continue to see an ample pipeline of investment opportunities. As a result, we are raising our 2016 acquisitions guidance to approximately $1.25 billion from our prior estimate of $900 million. Realty Income certainly has a lot of borrowing ability. The company has about $1.5 billion available on its revolving credit facility, and it has the credit rating and financial strength to issue bond offerings whenever it wants. Source: Realty Income investor presentation. Notice that Realty Income actually has slightly more debt than it did at the same time last year. However, because the debt ratio is significantly lower, it makes the company's financial condition stronger in the eyes of creditors. In fact, Moody's and Standard & Poor's both raised Realty Income's credit outlook to Baa1 "positive" and BBB+ "positive," respectively. Aside from increasing its acquisition volume to take advantage of cheap capital and strengthening its balance sheet, the best move Realty Income has made isn't really a move at all. The company's business model has one of the best risk/reward ratios anywhere in the market, and the proof is in the performance -- so why change a winning strategy? Realty Income has been able to increase its monthly dividends for 76 consecutive quarters (19 years), and has delivered an outstanding 18.2% annualized total return since its 1994 IPO. And, it has done so with less volatility than the average S&P 500 stock. As a Realty Income investor myself, the best move the company can make is to keep doing what it's been doing for another 20 years or more.